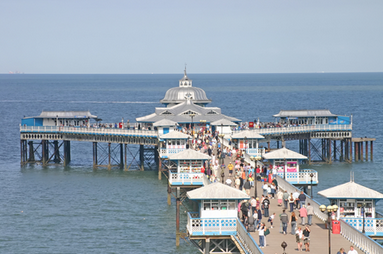 Take a look at information about North Wales. Includuing activities, places to eat, places to see and more. 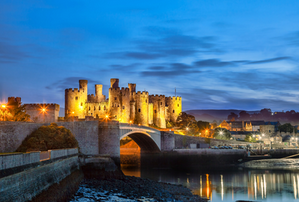 CONWY, a World Heritage Site, is the gateway to SNOWDONIA. The town is dominated by its 13th century castle which overlooks the medieval streets and harbour. CONWY is an excellent base for exploring NORTH WALES and a journey in any direction takes you to stunning scenery and empty beaches. So, you want to come to Wales? You'd like to see mountains, the coast, a castle and galleries and find great food and interesting places. Sounds like a lot of travelling, but not if you head for CONWY. This little gem on the North Wales coast is a microcosm of the whole region - it has everything you're looking for, and more besides. The town is full of character and is packed with fascinating sights along every higgledy-piggledy cobbled street and winding lane. The townscape is dominated by the imposing 13th century castle and walls which surround the old town. Edward ordered the building work in 1283 after he had defeated the Welsh and established English control of the Conwy valley. A series of Welsh rebellions had convinced him that a network of heavily fortified castles was needed to subdue the natives. The castle, which overlooks the Conwy Estuary, has massive walls and eight huge round towers. As the Welsh became less rebellious, Edward turned his attentions to picking fights with the Scots. But in 1403, with the English distracted, Owain Glyndwr led a rebellion which took the castle but then he gave it back in exchange for a ransom. The perfectly preserved castle and walls remain an impressive sight and are visible from just about everywhere around the town. Mountains apart, the castle is the biggest thing you'll find round these parts, but on a more modest scale there's Britain's smallest house, a tiny red-walled cottage by the quayside. And around the corner, Plas Mawr is one of the best preserved Elizabethan homes in the world, filled with original fixtures, fittings and furnishings and open to the public throughout the year. 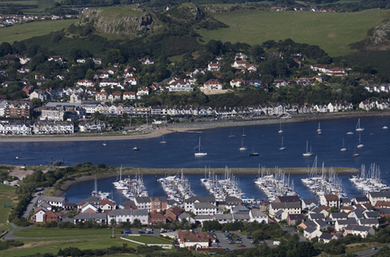 And although Conwy stands on a compact site by the mouth of the river Conwy, it has lots of other attractions, including historic houses and museums, galleries and studios and the marina and nature reserve. The town also hosts a packed programme of events, fairs and festivals throughout the year and the wider Conwy Valley is scattered with pretty villages, wonderful walks and stunning scenery. Every year hundreds of thousands of visitors come from all over the globe to savour the charming town's many delights; as you admire the buildings, shops and breath-taking views, you'll hear all manner of accents and languages which highlight Conwy's international appeal. Conwy is a 45 minute drive to Holyhead or direct train from Conwy for the fast ferry (90 minutes) to Ireland (train station linked to ferry port). To the east of Conwy is the Roman City of Chester a 30 minute drive. North of Wales is a land of majestic snowy mountain peaks and imposing castle fortresses, a rugged enclave of Welsh language and culture. 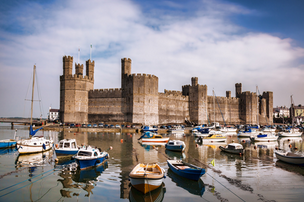 The many 13th Century castles that ring the coastline of North Wales were built by the English to subdue the Welsh Princes in their mountain hideaways. These mighty fortresses were the very peak of military planning in their day and are now designated UNESCO World Heritage Sites. The mountains of Snowdonia are famous throughout the world for their rugged peaks and horseshoe ridges, enchanting waterfalls and deep wooded vales. The Welsh name for the region ‘Eryri' means Place of Eagles and Mount Snowdon, the tallest mountain in England and Wales, dominates this sublime place. On the Llyn Peninsula and the Isle of Anglesey you will find some of the most unspoilt areas of Wales where the Welsh language is at its strongest. Anglesey is referred to as Mon Mam Cymru (Mother of Wales) and contains a wealth of Neolithic and Celtic sites. BUS: Stop 200 yards from cottages on the hour. If you want to leave the car behind, there is a railway station in Conwy which takes you to the Snowdonia National Park.